As we recently reported on our Boston Drunk Driving Accident Lawyer Blog, alcohol and the South Boston’s St. Patrick’s Day go together like peanut butter and jelly, or St. Patrick’s Day and green beer. We’ve discussed the dangers of drinking and driving and reviewed a number of ways to avoid these types of potentially fatal accident. Alcohol-related car accidents in Boston over the festive green holiday weren’t the only kind of accidents that officials had to deal with. According to ABC5, a parade-watcher wound up in the hospital after a catastrophic tumble from a roof during this year’s event. Officers report that the man, who was in his 20s, fell from a triple-decker apartment building along G Street just before 4:00 p.m. According to medical reports, the man is now paralyzed. Our Massachusetts personal injury lawyers understand that balconies, porches and decks are prime gathering places, particularly as we head into spring. Unfortunately, these rooftop seats can sometimes pose serious dangers and can result in serious injuries and even death. Sometimes the structure or the railings of balconies, porches and decks can be inadequate and can contribute to falls. These things can even collapse and cause a number of people to fall to the ground below, even burying the victims underneath the debris. The St. Patrick’s Day isn’t the only place where we have to worry about these kinds of accidents either. They can happen at social gatherings, at restaurants and even at rented homes. Many times, officials like to blame the overcrowding for these kinds of the accidents, but the truth of the matter is that t’s often concluded that the accident was caused by decay and poor maintenance. There are roughly 40 million decks, balconies and porches in the U.S. that are more than 20 years old, according to the North American Deck and Railing Association. You can image how many of those locations can be found in the historic city of Boston. Recent studies illustrate the risks many assume; many decks, balconies and porches are not maintained properly. 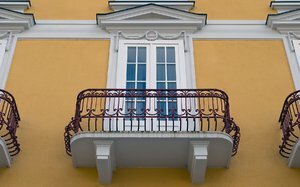 When property owners are negligent and don’t make sure that their premises are safe, including balconies, porches and decks, they can in fact be held liable. Officers with the Boston Police Department traveled up and down the parade route to help make sure that rooftop revelers were safe. Alcohol laws were also in full effect during the event. There were over 200 citations issued to parade watchers for public drinking. In 2011, there were more than 360 citations issued. Officers report that there were six people arrested during this year’s event. Among these arrests were charges of assault and battery with a dangerous weapon, disturbing the peace and possession of alcohol by a minor. Only three people were arrested during last year’s parade. The Massachusetts personal injury lawyers at the Law Offices of Jeffrey S. Glassman, LLC, have nearly 20 years in handling personal injury cases. We recognize that landlords and property owners have a responsibility to maintain a safe and secure environment for tenants, visitors and family members. If you or someone in your family has been injured or killed as the result of a Boston-area negligent condition, you’re urged to seek the assistance of an experienced attorney. Call 1-888-367-2900 to set up a free and confidential consultation to discuss you rights.